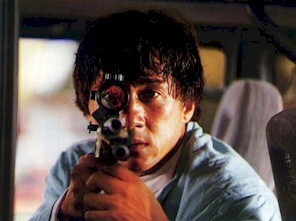 The Skinny: Another Police Story installment that ignores all the previous ones. A fun film with some good action, but unfortunately zero personality. Jackie Chan returns in yet another Police Story installment. This episode finds Chan Ka-Kui at the center of a KSB/CIA/Interpol “Broken Arrow” scam. Thanks to the usual set of movie circumstances, Chan is called into an international escapade that traverses two continents, a number of different countries, and more Caucasian actors than we're used to. What follows are typical Jackie Chan fights and stunts, as he eludes the bad guys and his superiors, who were setting him up, anyway. Chan's in decent form but still, he’s showing his age. Where once there was all-out mayhem and stuntwork, there is now...a plot! No character development, though. The filmmakers are content to throw in your standard emotional plot devices like dead relatives of minor characters, or Chan's usual outrage at being framed and chased all over the globe. Still, none of the emotion is new or particularly gripping. It's just filler for the action sequences, which deliver with the usual Chan panache but not the all-out abandon that made him famous. There are some good stunts and all, but nothing here even comes close to the all-out insanity called Police Story 1 or even Supercop’s well choreographed stunt mayhem. There is one terrific central action sequence, and the shark tank chase at the end is fun, but nothing else truly surprising happens. Notes:  First Strike was brought stateside in January 1997 by New Line Cinema. Close to 30 minutes was trimmed out of the film, which isn't that big a deal. However, the ending shark tank sequence was re-edited and truncated to make it move faster. As a result, the charm and deliberate pacing of the sequence is lost, making the US version yet another case of watered-down Chan.